Do you have need of extra space and can't afford the cost of renovating or adding onto your home? 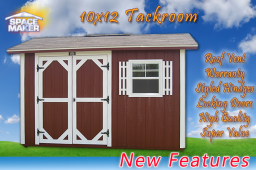 In many cases, this is the reason that people opt to purchase outbuildings or portable storage buildings. However, these can be difficult to customize and often don't include the option for windows, shutters, and interior shelving units as add-ons. While many custom builders will be glad to take the money you have and create an okay design for you, our buildings are not only pleasant to look at but also sturdy and efficient. 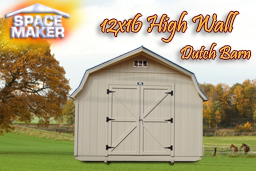 Take, for example, the 12x28 gable we have to offer. Built upon 4x6 pressure treated runners and 2x6 floor joists on a 16-inch center, covered by smoothly sanded plywood decking. 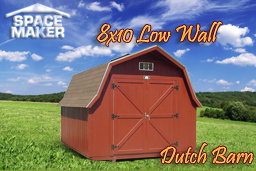 This makes our portable storage buildings excellent for any use, safe to walk on, and sturdy for mobility. Covered by an insulated roof decking and 25-year shingles that overhang all four sides, adding protection for the exterior walls. Everything inside the building will also be well protected from the elements. Inside walls with additional weather protection for our portable buildings with Western Fir siding that incorporates a primer that has been baked on to aid in making the paint last longer. 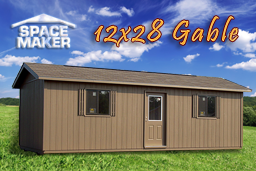 Full of customizable options such as the ability to add windows and shutters to the 12x28 gable and design shelving inside to your specifications by working with our custom builders. A gable of this size could be used in several ways, including the ability to create a garage that may not currently exist, build a new master bedroom suite, or add a family room with extra space to your existing home. 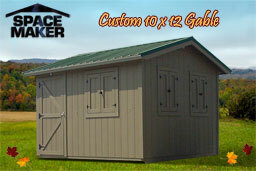 You can even simply use the 12x28 gable, with its size, as a large storage shed. 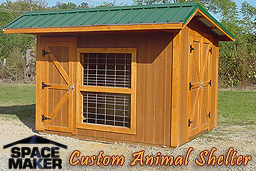 If this particular design is too large, see some of our smaller gables or other designs, including our custom buildings that can be ordered to meet your specific needs.